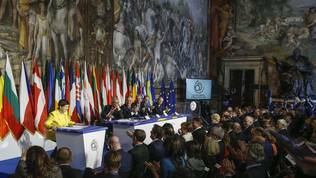 On his 60th birthday, the European Union decided to part with its idealism and move towards pragmatism. As euinside reported over recent years (here and here), the romantic period of the Union - the unification of Europe and the invention of a mechanism for preserving peace - is long over. A new era has begun in the life of the European project. This is the conclusion that can be derived from the Rome Declaration, signed at an official ceremony in the Italian capital on 25 March. It can also be concluded from the document that the Union has learned many lessons over the past 60 years, but is also rediscovering its achievements. The text of the declaration differs significantly from the document, adopted on the occasion of 50th anniversary of the Treaty of Rome. On March 25, 2007 the leaders agreed on a text, which is very general and reaffirms the idealism of the project. Ten years later it is a very different situation, as we recently reported, which requires a change of approach. 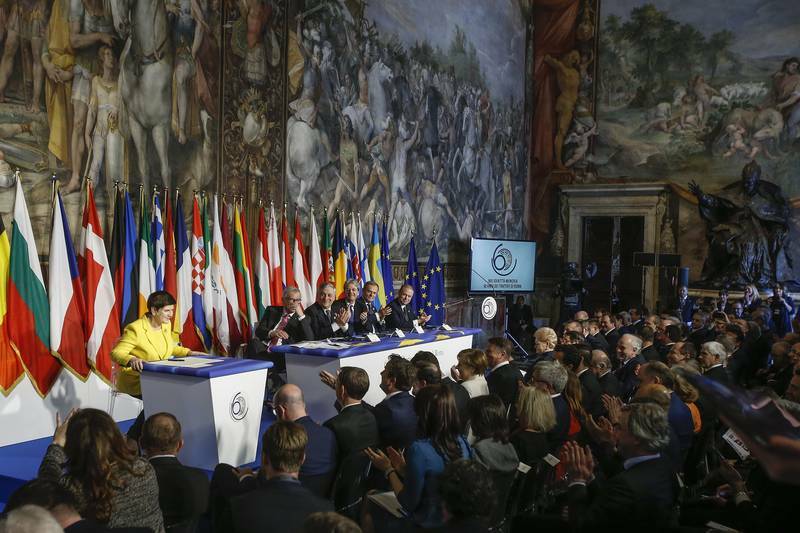 There are several important messages in the declaration signed by the leaders of all member states, excluding Great Britain, as well as by the bosses of European institutions in the Rome Municipal Hall, in which 60 years ago the Treaty of Rome was signed, laying the foundations of today's Union. 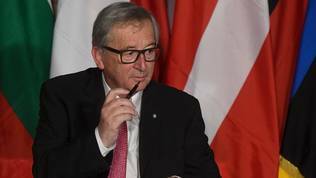 The leader of the European Commission and European political scene veteran Jean-Claude Juncker (Luxembourg, EPP) signed the declaration with the very pen that was used to sign the Treaty of Rome by the Luxembourg prime minister of the time Joseph Bech. The first important message is that the Union is committed to strengthen itself and be more sustainable through greater unity and solidarity and by observing the common rules. This is practically a reaffirmation of the commitment in the EU founding treaties for an "ever closer Union" - a phrase that was the main frontline for the advocates of the UK leaving the Union. Focusing on compliance with common rules is another important part of this message. One of the biggest novelties in the document is that the principle of multi-speed integration is now official. It points out that this unity is "both a necessity and our free choice" which is a prelude to the next paragraph in the declaration, stating that “we will act together, at different paces and intensity where necessary, while moving in the same direction, as we have done in the past, in line with the Treaties and keeping the door open to those who want to join later. Our Union is undivided and indivisible”. For several months the leaders of countries that are moving at a slower pace, made serious efforts to explain that the multi-speed Europe has long existed. But the fact that this text has found a place in a declaration of this magnitude clearly shows that the unity that the fathers of the project dreamt of is difficult to achieve in a Union of 27 states, and possibly more. Croatian Prime Minister Andrej Plenković warned that the process of integration at a higher gear needs to be inclusive and avoid a situation, where the most powerful and influential states dictate the rules. He believes such scenario will boost anti-European moods in all member states. Croatian MEP Jozo Radoš of the Liberals group warned that using the enhanced cooperation procedure is not yet a step towards federalisation, but could lead to more disunity. "I do not advocate this scenario; I rather fear it in a way. I think it would be a defeat of the idea that countries should be together. But in some areas where there is no other way, enhanced cooperation can be developed. I think this idea of a multi-speed Europe should not be developed, but be used only in situations where there is no other way", he told euinside. Bulgarian President Rumen Radev was not worried by the statement for a multi-speed Europe, but warned that it is important not to change the rules mid-way, as it happened with Bulgaria's Schengen membership. He forecasted that from now on the enhanced cooperation procedures will be used much more and everyone willing and able can participate. For its 60th anniversary, similar to the 50th, the Union reiterated its commitment to core values ​​such as freedom, democracy, and the rule of law. 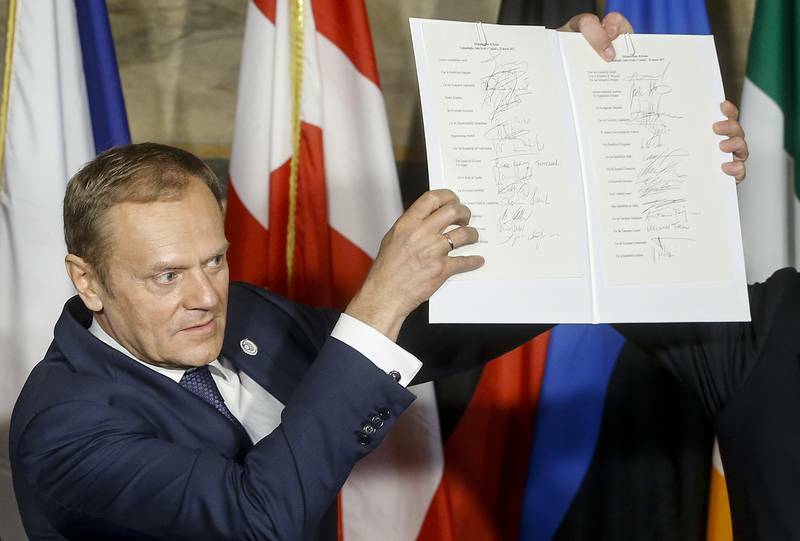 The declaration had a clear message to the countries that aspire to EU membership. One sentence in the declaration is dedicated to them: "We want a Union which remains open to those European countries that respect our values and are committed to promoting them." This message comes at a time when the enlargement process has shown that there is a limit to the transformative power of the Union. Democracy and the rule of law are difficult to take root in the countries of the Western Balkans, and Erdogan's Turkey practically refused to pursue that path. The statement that the EU remains open, but only for countries that share its values and even promote them, can be considered as a warning to the candidate countries. 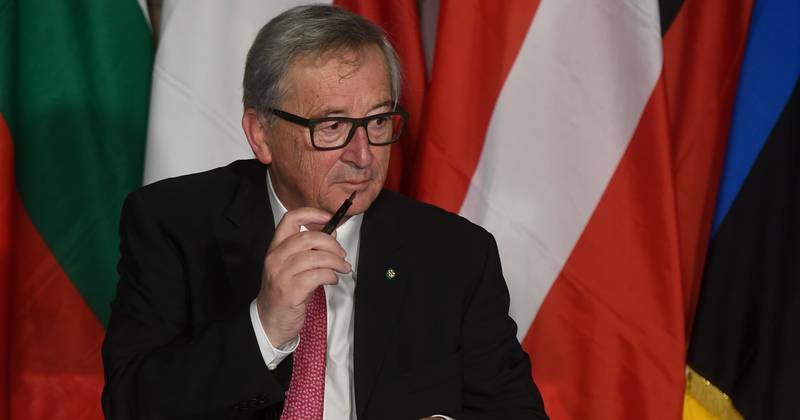 It can have the same effect as Jean-Claude Juncker's phrase of 2014 that within this term in office there will be no further enlargement of the Union. News in the Rome Declaration on enlargement is that the EU train begins to move faster and some may not be able to board. What are the next integration steps? Currently, the cores of a more enhanced integration are the euro area, Schengen, and the enhanced cooperation procedures that have so far been opened on the financial transactions tax, the European Prosecutor's Office, and property relations in mixed marriages and partnerships. All these are dossiers that are already being worked on, or are already completed. The euro area and Schengen are large and complex integration steps that are the result of changes in the founding treaties or separate treaties. The enhanced cooperation procedure is a last resort when no unanimity can be achieved in the adoption of new EU legislation. A new major integration step in the field of defence is upcoming in creating a defence union, which is already being worked on. Its purpose will be to secure the Union's autonomy in decisions when NATO cannot be relied on, but at the same time it should not double NATO's functions. The task is difficult, but at this stage there is will for it in all corners of the Community. Another integration step is expected in the social sphere. This is a subject on which efforts have been made for years, but progress has not been particularly strong, as the subject always comes into the left-right track. On the eve of March 25 in Rome, a meeting was held with the social partners in the EU and an agreement was reached to create a so-called social dimension of the Union. This was the focus of the statement after the signing of the Rome Declaration by the Malta Prime Minister Joseph Muscat, whose country currently holds the six-month rotating presidency of the Council of Ministers. 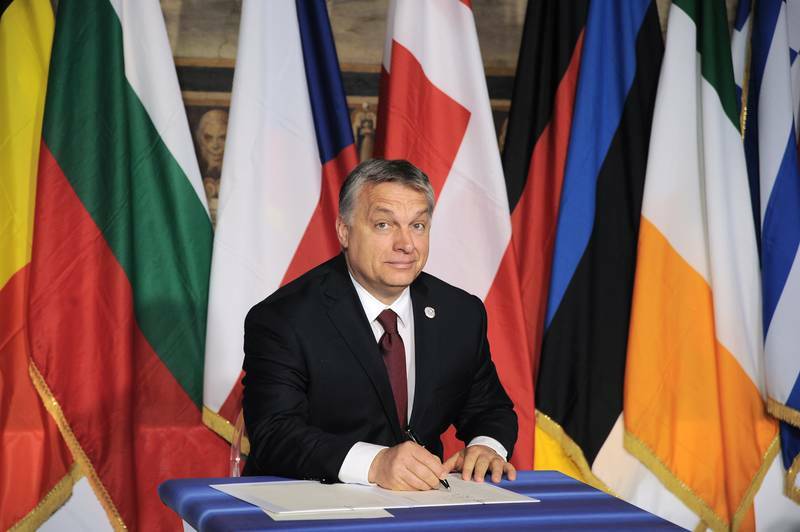 "I think actually that one of the biggest steps forward, that we have made today in this declaration, is general acceptance that there is a social dimension in Europe", said Mr Muscat. European Council President Donald Tusk (Poland, EPP) clarified that there is work to be done for a high level of social protection, initially discussing the best practises in Europe. Integration steps will be taken and are already being taken in the fight against terrorism and in common security. There will be work on common foreign policy as well. These integration steps are with a 10-year horizon, which means that they should be fact for the EU's 70-th birthday. The signing of the Rome Declaration was preceded by serious clashes and conflicts. In the week before the ceremony Polish Prime Minister Beata Szydło once again raised the degree of tension by threatening that she would not sign the document. Her actions were driven by an attempt to smooth out in domestic politics the consequences of the heavy loss that her Eurosceptic government suffered in the battle against the reappointment of Donald Tusk as head of the European Council. Greek Prime Minister Alexis Tsipras also threatened not to sign in an attempt to extract more concessions on the implementation of the third bailout programme for Greece. These two cases are just symptoms of the larger problems which the EU has faced in the decade between its 50th and 60th anniversary. In response to all this the best celebration of the birthday of the Union was done by Donald Tusk, who delivered a very strong, emotional and personal speech in which he compared the timelines of the EU and Poland (as a representative of the former communist countries). He refracted European evolution through important periods in his own life. He began with the fact that he was born in a city, destroyed during World War II, in the year when the Treaties of Rome were signed. "I was 8 years old when the Community established a single council and a single commission through the Merger Treaty; the road I then took to school every day still led through the ruins of the burnt city [Gdańsk]. For me, the Second World War is not an abstraction", he said as if to explain why it is necessary once more to talk about the original purpose - the preservation of peace on the continent, in the declaration on the occasion of the 60 anniversary of the EU. "In 1980, a year after the first elections to the European Parliament, in my Gdańsk, the Solidarity movement, Solidarność, was born. When in 1987 the Single European Act (the beginning of the Single Market) entered into force, we in Poland were preparing ourselves for the final battle. Solidarność won, and soon after, the Berlin Wall also fell". 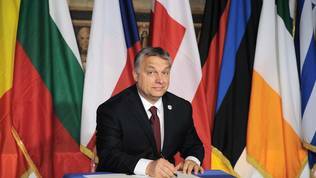 Donald Tusk’s message was aimed both at those Western leaders, who have long forgotten what it is like living under a dictatorship and at those, who are attempting to implant nostalgia about the times of the Communist dictatorship. 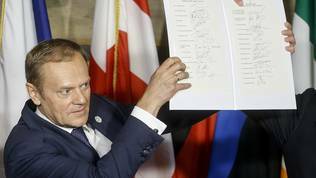 Donald Tusk urged that after Rome the EU is much more of a Union of like principles and political unity. European Parliament President Antonio Tajani (EPP, Italy), too, stressed in his speech on the role of the EU for the removal of dictatorships. He named the Union a “new European Renaissance” and the prime minister of Malta added that there is much more work to be done until all EU citizens are equal. He placed a special accent on gender equality and the members of the LGBTIQ community gaining full equality in Europe. On the eve of the anniversary Pope Francis reminded that Europe is not a a conglomeration of rules to obey, or a manual of protocols and procedures to follow. “It is a way of life, a way of understanding man based on his transcendent and inalienable dignity, as something more than simply a sum of rights to defend or claims to advance”. The general atmosphere of the ceremony, surrounded by the millennial history of Rome and Europe, reminded that Rome wasn’t built in a day. Regardless of the speed of integration in the EU, it is important that the direction is the same – forward towards improving the community and the freedom of the individual, rather than back towards a past we ran away from.